How To Order Field Sales For a presentation of our latest designs please contact us for a Field Sales Representative to visit at your convenience. Website www.kitheathretailer.com Order 24/7 on our B2B trade website. Direct Despatch We can send specific orders direct to your customer on your behalf. E Alerts Be the first to see new designs, offers and updates, simply provide us with your email details to keep up to date. Payment Credit/Debit Cards We accept Visa, Mastercard, Maestro and Delta. Cheques Cheques to be made payable to Kit Heath Ltd. Useful Info Chains All pendants are priced and sold exclusive of chains, remember to add chains to your order to suit your selection. Find our complete chain offer on page 121. Delivery All product orders received by 2pm we aim to despatch the same working day. No carriage is charged on mainland UK orders over £200. UK Delivery Charges Free postage on orders over £30 on the first Wednesday of every month. £3.50 (minimum) will be charged on orders under £200. Overseas Delivery Will be charged at cost. Gift Packaging Dew is sold exclusive of packaging to enable you to self-brand or with optional packaging available separately at the point of order. Remember to state clearly if boxes are required and we can select appropriate box sizes to suit your jewellery order and despatch together with your jewellery. To reference gift packaging see page 83. Boxing Service We offer a boxing, chaining and labeling service. Please contact our sales team for further information. Point of Sale (POS) Displays and Graphics Point of Sale is provided free of charge with an initial order of £500 see page 82. Additional components are available. Graphics Attractive window graphics for display to enhance your back board displays and individual collection story telling are available see pages 84 and 85. Also available for web banners with the Dew logo or your own brand upon request. Engraving Our engraving service is available free of charge for Dew orders with jewellery suitable for engraving. Engravable pieces are denoted as such in the quick reference guide. For font selection please see page 86. For more engraving advice please contact our sales team. Style with a Twist, as well as Swirls, Knots and Bows. Colours of the rainbow, vibrant semi -precious and cubic zirconia stones, pearls and shells. Presented in clear collection stories within this easy to reference catalogue, backed and delivered by our renowned customer service team. With personalisation trending, Dew offers layering together with mix and match opportunities and a free engraving service. ....Hoops, loops and balls. Simple, classic and modern profiles. Dew is KH Limitedâ&#x20AC;&#x2122;s entry sterling silver collection for independent jewellery and gift retailers. It offers a curated selection combined with specially designed profiles, created in-house. Your favourite profiles for the star in your life or the love of your life. Inspired by current trends and stylish classics, Dew includes charming and fun profiles, fashionably pretty and geometric shapes, as well as touches of colour and sparkle. Dedicated to all the animal lovers out there who love our four legged and furry friends. Dew offers an irresistible selection of designs for every occasion. Welcome to the Dew 2019/20 catalogue. From flowers to butterflies, here you will find all things inspired by Nature. It can be supplied either as a branded package with point of sale and gift boxes or unbranded (for you to add your branding), to suit your retailing needs. No minimum order value and same day despatch make replenishment quick and easy. Dew offers perfect jewellery gifting quality, value and style. Pendants sold exclusive of chain. Kit Heath copyright ©. Pendants sold exclusive of chain. Kit Heath copyright ÂŠ. Animals Dedicated to all the animal lovers out there who love our four legged and furry friends. HEARTS & STARS Your favourite profiles for the star in your life or the love of your life. Pendants sold exclusive of chain. Kit Heath copyright Â©. Move the sliding toggle to adjust the length of the necklace. CN07GRG Move the sliding toggle to adjust the length of the necklace. Try wearing with a backless outfit. Twists, Knots & Swirls Style with a Twist, as well as Swirls, Knots and Bows. to adjust the length of the necklace. A delightful collection for little girls. Dinky Dew jewellery is not suitable for the initial piercing or healing period. Not suitable to be worn by children under 3 years due to small parts. Jewellery is not a toy and should not be given to babies and young children to play with. Jewellery should not be worn for prolonged periods and never overnight. Perfect for Flower Girls, Naming Ceremonies, Christenings and Birthdays. 4. Box LBDBSTU suitable for studs, pendants and necklaces. CHOKING HAZARD Not suitable to be worn by children under 3 years due to small parts. Jewellery is not a toy and should not be given to babies and young children to play with. Jewellery should not be worn for prolonged periods and never overnight. Base display 300mm(w) x 200mm(d). Can also be displayed longways. Gift Packaging Boxes available to order separately. Ask about our boxing, barcoding and label service. Display Cards Enhance your presentation with these tent cards. Available free of charge on request. Backboards NEW Dew displays for 2019. Ideal for cabinets and window display. Available free of charge on request. Acrylic holder supplied. Bespoke graphics can be requested. Information - how to use your Quick Reference Guide: •	Quickly find jewellery by type and code. •	Reference a design to its matching set by page number ( shown in the ‘Collections’ section of the catalogue) at actual size. •	Identify the price for each design. •	Understand the design features; available ring sizes, stones, finishes and necklace lengths. •	All pendants are sold exclusive of chains, please order chains separately - shown on page 121. •	Engravable jewellery has been highlighted. Our engraving service is available free of charge. A choice of four fonts in lower and upper case. Codes/Prices Explained For example:	1035CZ 08025. Code	The design reference code is the first 4/5 digits, ie 1035. Stone/finish (stone/finish guide page 122)	The last 2/3 letters show the stone and or finish. ie CZ = Cubic Zirconia. Prices	The trade price is disguised in a five digit code. This is done by replacing the decimal point with the number 0, ie. 08025 = £8.25. All prices are exclusive of VAT. © Copyright Kit Heath Ltd.
Caring for your Dew Jewellery To help keep your Dew sterling silver looking beautiful, we recommend you care for it in the following ways: •	Polish your sterling silver jewellery using a high quality silver cloth. •	We do not recommend the use of silver dips. •	Remove jewellery when bathing and swimming. •	To bring back the sparkle to faceted gemstones use warm soapy water and a soft brush, and rinse with clean water. •	Items with gold plating detail we recommend for occasional wear only. •	When not wearing your sterling silver jewellery, store in a sealed grip seal bag. Care guide included in each gift box. See page 83 for further details. Shown at actual size unless otherwise stated. Silver Studs Shown at actual size unless otherwise stated. Packaging suitable for studs. See page 83 for further details. Not shown at actual size. Silver Drops Not shown at actual size unless otherwise stated*. Sleepers Not shown at actual size. Packaging suitable for drops. See page 83 for further details. Anklets Not shown at actual size. Also suitable for anklets and sleepers. Brooch Not shown at actual size. Packaging suitable for wristwear. See page 83 for further details. Bracelet Box (also Set Box) Also suitable for brooch. Not shown at actual size unless otherwise stated*. Packaging suitable for neckwear. See page 83 for further details. Sterling Silver Chains For pendants which are sold exclusive of chain. Order 100 or more, of the same chain, same length and receive 15% discount (not to be used in conjunction with any other offers) Kit Heath copyright ©. Please note some designs use natural stones therefore variations in size, colour and inclusions are to be expected. Terms & Conditions The placing of an order will be deemed as acceptance by the customer of these terms and conditions. Ordering Initial orders are on a pro forma basis. The initial minimum order value is £100 (net of VAT), thereafter there is no minimum order. Payment Sterling/Euro cheques and bank drafts should be made payable to Kit Heath Ltd. accept Visa, MasterCard, Maestro and Delta card payments. The customer may apply for a credit account by completing a Kit Heath Ltd account application form. Upon receipt of satisfactory credit references, an account with a credit limit will be opened. Please note that a credit referencing agency may be used in evaluating suitability. All invoices will be subject to our payment terms of 30 days net. No payment will be deemed to have been received until Kit Heath Ltd has received cleared funds. Overdue Accounts Kit Heath Ltd reserves the right to suspend or cancel future deliveries, charge interest (2.5% over Lloyds bank base rate) and any legal costs incurred if payment is not received by the agreed due date. Retention of Title Goods remain the property of Kit Heath Ltd until such time as all sums due by the customer have been paid in full to Kit Heath Ltd. The customer shall be entitled to deal with or sell the goods (and other products in which the goods are incorporated) at full market value in the normal course of its business, provided that the customer shall be liable to account to Kit Heath Ltd for the proceeds of such sale. Prices Prices are net of VAT. Prices are correct at the time of going to press. We reserve the right to alter prices without notice. Goods will be invoiced at the current price at the time of despatch. Delivery Delivery charges are based on the value of goods (net of VAT). No carriage is charged on mainland UK orders over £200. Carriage costs for orders under £200 will be £3.50 (minimum). All product orders received by 2pm we will aim to despatch the same working day. If you require guaranteed next day delivery please ask your sales contact and we will inform you of the additional costs. Unfortunately we cannot guarantee next day delivery for all parts of the UK and Ireland. Scottish Highlands and Islands, the EC and overseas deliveries will be charged at cost. 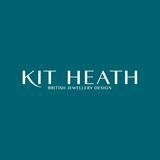 Copyright Kit Heath Ltd is the owner of design rights and registered designs including jewellery designs, marketing and packaging materials. Returns Items delivered broken or faulty or supplied incorrectly should be reported to Kit Heath Ltd within 7 days of the invoice date. Each item must be returned in an individual plastic bag with the Dew item code clearly marked. Goods that require additional handling will incur a handling fee. Faulty items will be replaced provided that the damage has occurred prior to delivery to the customer or if it is clear that there is a manufacturing fault. Items that Kit Heath Ltd considers to have been mistreated or damaged through wear and tear cannot be replaced or credited. Restrictions on the Sale of Goods Dew may only be sold under the collection name of Dew or unbranded as a white label collection. Dew may not be sold and displayed under the brand name Kit Heath. The customer is not authorised to sell Dew products under company names, trademarks or domain names that contain words identical or similar to the Kit Heath trade mark. The customer in respect of Dew must have no affiliation to Ebay or Amazon websites. Kit Heath Ltd Millennium House Roundswell North Devon EX31 3TD United Kingdom Our Sales Office is open Monday - Friday 8.30am to 5.00pm.